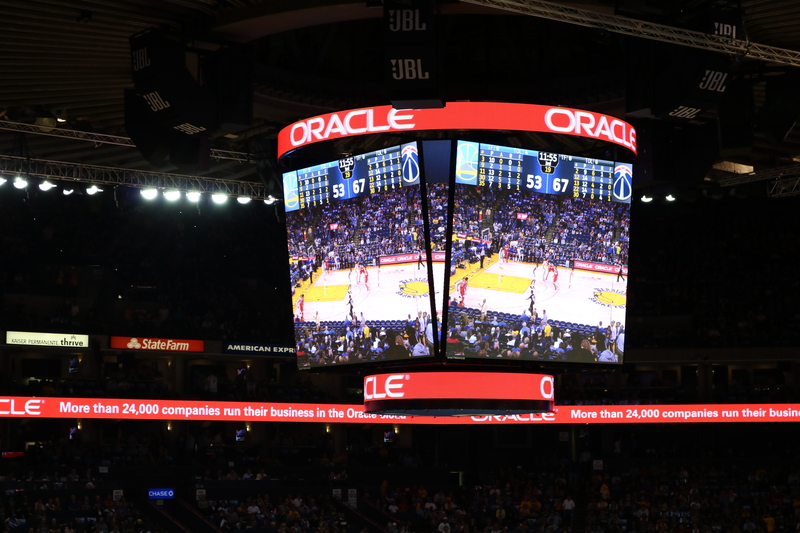 Toshiba America Business Solutions' newly-installed ultra high-definition (HD) digital signage is improving the fan experience at Oracle Arena in Oakland, Calif. The Lake Forest, Calif. tech company's LED ribbon displays stream in-game team and player statistics in dazzling ultra HD at the Golden State Warriors’ home venue. Toshiba's state-of-the-art digital signage within Oracle Arena, also spotlights upcoming games, concerts and special events while streaming sponsor advertisements in brilliant 56 by 1840 resolution. A nearly 3-foot wide 360-degree ribbon display splits the sports and entertainment venue’s upper and lower decks and stretches 950 feet around the perimeter of Oracle Arena. Toshiba’s digital signage also rings the top and bottom of Oracle Arena's main scoreboard above center court with 2-foot wide ribbons. The scoreboard’s upper ribbon display streams information in 40 by 1840 ultra HD resolution and measures 96 feet long. The ribbon display on the lower section of the scoreboard is 50 feet long and streams in 40 by 960 ultra HD resolution. “We are excited to work with Oracle Arena on this exciting project," said Bill Melo, Toshiba America Business Solutions chief marketing executive. "It was important for us to implement state-of-the-art products to help enhance the fan experience at Oracle Arena." Oracle Arena and Oakland-Alameda County Coliseum, managed by AEG Facilities, are the premiere sports and entertainment complexes in Northern California. They are the home of the NBA’s Golden State Warriors, the NFL’s Oakland Raiders and MLB’s Oakland Athletics as well as host to concerts, family shows and special events. Additional information on Oracle Arena and Oakland-Alameda County Coliseum, including a complete schedule of events can be found online at www.oraclearena.com.